Grey's Anatomy Promo: Hotties and Hot Tubs! Jackson Avery may be reaping the benefits of being a billionaire, but he knows how to share the wealth. On Grey's Anatomy Season 14 Episode 6, the smoking hot men of Grey Sloan Memorial take some time off and head to the water when Jackson invites the gang to join him on a boating adventure. It looks like all of the key men of GSM are present, sans Nathan, of course. Yup, it's official. Nathan is happily away in Malibu with his family and has left Seattle behind him. So what could all of these guys putting the fine in Seattle's finest be up to? Well, it sounds like Ben confides in the fellas about his firefighting dreams. Except, now he has to rely on none of them to tell Bailey. How long can that last?! Owen and Amelia have taken their breakup in stride and may be better friends than they were as a couple. 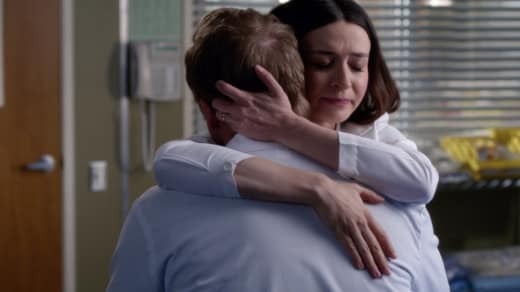 Is Amelia really teasing Owen about getting back into the dating pool? Is Owen actually smiling and happy? Apparently! Not to be outdone, the women have some fun of their own with a case that will be nothing if not memorable. It's sure to bring some laughs. You can watch Grey's Anatomy online here at TV Fanatic. Check out the promo to "Come On Down to My Boat, Baby!" below. Grey's Anatomy Season 14 Episode 6: "Come On Down to My Boat, Baby"
If I had that much money, I wouldn't be here. I'd buy a boat, a big boat. Permalink: If I had that much money, I wouldn't be here. I'd buy a boat, a big boat. Owen: Do you think we got this wrong? Made the wrong decison? Amelia: No, but I wish I did. Permalink: No, but I wish I did. Grey's Anatomy Round Table: Jo Takes A Big Step!